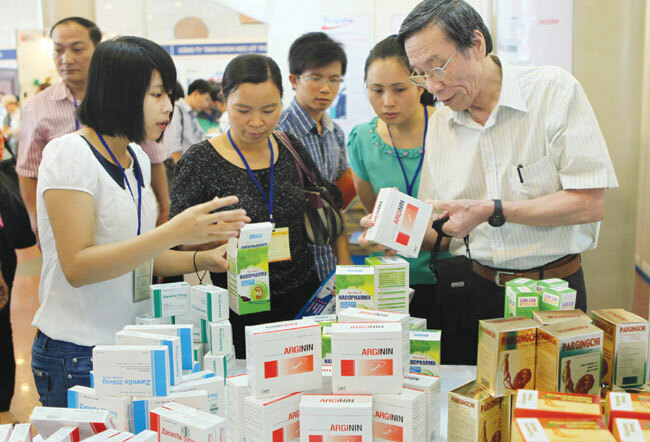 HA NOI (VNS) — The latest development plan for the pharmaceutical industry sets ambitious targets that can create growth opportunities, but could also prove difficult for local firms to achieve, experts say. They told Viet Nam News that the plan's feasibility would depend on follow up support policies from the Government. A prominent target in the plan is to have medicines made in Viet Nam to account for 80 per cent of the nation's consumption by 2020. The plan also targets having 30 per cent of the locally made drugs use traditional materials. The "National Strategy for Pharmaceutical Industry Development till 2020 with a vision to 2030" was approved recently by the Prime Minister. Other targets include ensuring 100 per cent supply of medicines needed to prevent and treat diseases, and meeting 20 per cent of materials demand for locally produced medicine. The plan also seeks to have locally-made vaccines meet the needs of the National Expanded Programme for Immunisation as also 30 per cent of the demand for paid vaccinations. Officials say the plan is a positive one for the domestic pharmaceutical industry as also disadvantaged sections of the society, especially the poor and people living in remote and mountainous areas. "The strategy aims to provide sufficient, safe medicines at reasonable prices to meet the country's demand for disease prevention and treatment," Truong Quoc Cuong, director of the health ministry's Drug Administration of Viet Nam, told Viet Nam News. "Priority would be given to supply medicines for social welfare policy beneficiaries, ethnic minorities and poor people in mountainous and remote areas," he said. Cuong also said that the pharmaceutical law will be revised with a focus on encouraging the production and use of locally manufactured medicines through standardisation of trading rules and application of good practice standards. Policies to promote research, production, import and export of essential medicines will be issued as part of the efforts to provide high-quality medicine at reasonable prices, he said. Cuong said the country's pharmaceutical industry would be developed with a focus on production of generic medicines. Imported drugs would, step by step, be replaced by locally produced ones, he added. "Policy priority will be given to the production, supply and use of generic medicines, specific drugs, vaccine and biological products and drugs from traditional medicine materials. Import of pharmaceutical materials and generic medicine would be limited for medicines produced in the country." The Government will also support the use of locally manufactured medicine with funds from the State Budget and through health insurance schemes, he said. Le Thuy Linh, a housewife in Ha Noi, said she was happy with what she had heard about the new plan because it would benefit many people, especially those in rural areas. "I hope that everybody will be provided sufficient medicines at reasonable prices and with good quality instead of imported ones at cut-throat prices," she said. Several pharmaceutical experts said that some targets mentioned in the plan would be difficult to achieve. They said an increase of more than 30 per cent in the country's total medicine consumption within the next seven years presents a tall order for local drug companies. Local firms would find it tough to expand their market share, increase product quality, establish trademarks and compete against imported products, the experts said. The Health Ministry has acknowledged that the local pharmaceutical industry faces a lot of disadvantages in competing with foreign companies because of modest capital resources at their disposal, a shortage of pharmacists and outdated technology. Studies have also noted that domestic investment in pharmaceutical research and development is miniscule and medicines are mostly produced using imported materials. Industry insiders are ambivalent about the strategy, with some skeptical about its feasibility and others optimistic about development opportunities. Traphaco JSC General Director and Chairwoman Vu Thi Thuan told Viet Nam News that the strategy would boost development of local firms thanks to the Government's support in terms of policy and financial resources. "International experience shows that there is no country except Switzerland, where locally manufactured medicines dominate imported ones," she said. Thuan also said that consumers would decide the fate of the strategy through the choices they make. "Success of the strategy would depend on a change in Vietnamese people's awareness and belief in local medicine which, in turn, would depend on the success or failure of the programme encouraging Vietnamese people to use drugs made in the country." Chairman and CEO of the Hau Giang Pharmaceutical Company, Pham Thi Viet Nga, said that the strategy was a very good sign for local pharmaceutical firms. "However, its feasibility would depend much on the government's future policies for supporting local drug firms in competing with foreign companies," she said. Nga said local pharmaceutical firms have the daunting challenges of the people's lack of confidence in locally manufactured medicine and unfair competition between themselves. The Government also limits local firms' spending on promotion, she said. Cuong of the Drug Administration of Viet Nam agreed that implementing the strategy effectively would be a challenging task, especially in the perfecting of mechanisms, policies and master plans so that achievements can be sustained and investment in the industry increased. The country also faced a shortage of human resources and the limited investment and research capabilities of local firms, he said. Health Ministry statistics show that Viet Nam currently has 121 western medicine manufacture factories and 17 making traditional medicines that have met the World Health Organisation's Good Manufacturing Practice (GMP) standards. In 2012, the value of locally manufactured medicines made up 46 per cent of the nation's total consumption. "They (local drug firms) would have to work hard to increase output in order to account for 80 per cent of the country's total medicine consumption and 100 per cent of vaccines for the immunisation programme," Cuong said.